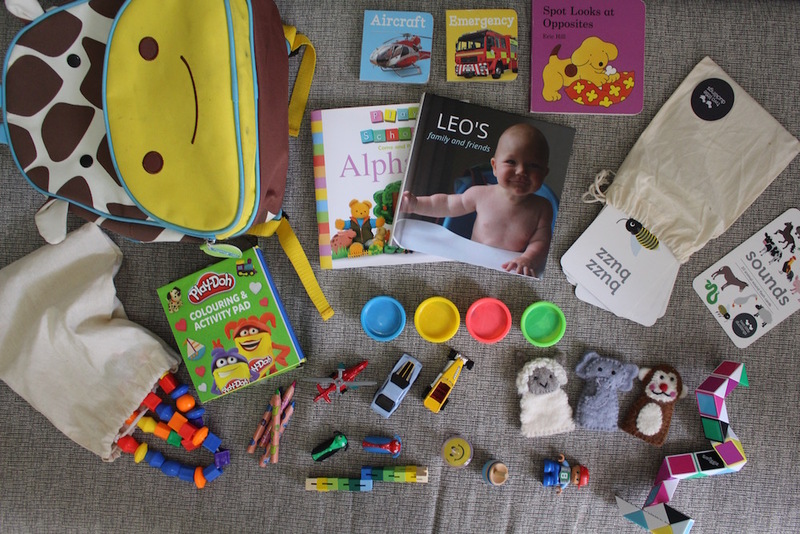 We’ve been travelling full-time for several months, and so far, my toddler has only had a small selection of carefully chosen toys that fit into a yellow giraffe backpack. Before we left I was gathering toys and activities like a madwoman, constantly worried that dramatically reducing his toy count and squeezing it all into carry-on luggage would give him ‘less opportunity’ or ‘put him behind’ developmentally. We carefully chose a selection of open-ended toys and ended up with 8 books, two sets of flashcards, a handful of toy cars, planes and helicopters, 4 small Play Dough tubs, sticker books, finger puppets, basic art supplies, beads for threading, two soft toys for bedtime, spinning tops and some small battery powered beetles. We made ourselves a criteria checklist that helped us choose. What we packed for our 2-year-old boy. Leaving the big dump trucks, Duplo sets, wooden blocks, sand toys, car garages and hundreds of books at home in Australia was HARD! But within a few weeks we realised that our son wasn’t getting sick of the toys he had. If anything, he loved them MORE! We noticed he spent a lot more time with each toy, and they were really ‘well-loved’ instead of being used once and thrown deep into the bottom of the toy box. We also noticed our son would often find other things to occupy his time. As adults, we tend to forget that play only comprises one part of a child’s free time. 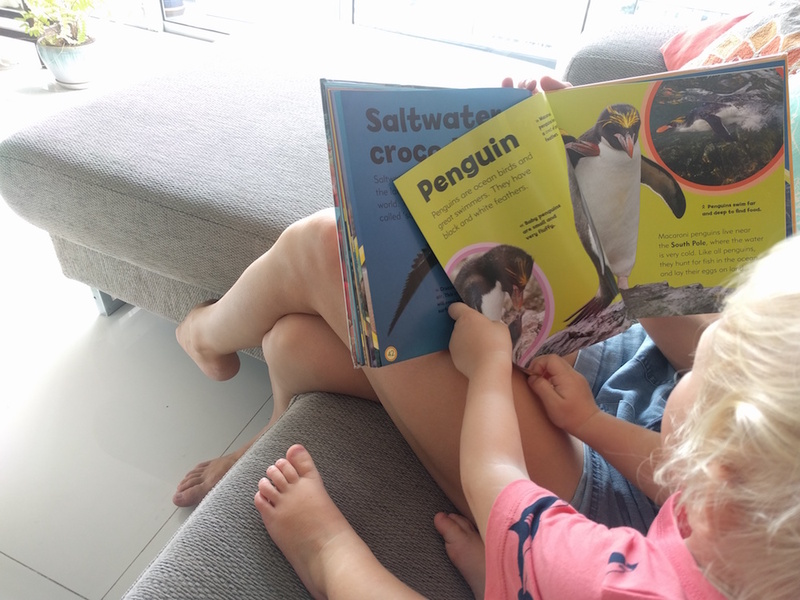 Other things that toddlers like to do are reading, observing (nature, cars on the street below, bigger children playing in the park) spending time with animals, creating artwork, helping with chores, swimming, walking outside, sightseeing, running in circles (a good energy burner!) listening to music, rearranging furniture… the list goes on. Recycling is brilliant because you’ll likely buy ingredients and supplies while travelling that can easily be made into temporary games and then discarded (without guilt!) when you change locations. In Penang, we used packaging to make a train for Leo. These are usually cheaply found, easy to travel with and provide endless entertainment when swimming and playing at pools or the beach. The blow up car was a definite hit in Bali! When we stayed with relatives who teach at an international school in Kuala Lumpur, they were kind enough to organise a parent friend to lend some toys to our son. We were also able to borrow books from their school library and return. Many public libraries also have toys and games that can be borrowed and returned, though this can sometimes be tricky if you’re not a national resident. We travel without a stroller, so something we’ve been conscious of is increasing our son’s endurance when walking longer distances. Not having a car means we usually walk about 10km a day, and our 2-year-old now walks for about half that distance (with the other half carried by my husband in the hiking backpack. Sure it’s slow, with lots of stops and starts, but we love to see his balance, agility and endurance develop. Walking 10km a day is easy when the view is like this! Travelling full time comes with its challenges – the biggest one is that being a nomad means you rarely get a break from your child. Taking your toddler to a play centre is a great way for them to have some new toys to play with, meet some other children and often there’s a coffee shop on the premises where parents can relax and watch their child. If we’re staying in accommodation for longer than 2 weeks and there’s no bath, we usually buy a big plastic bucket. Not only can we give Leo his nightly bath in the bucket, it also doubles as a middle-of-the-day wet play option, and a place to carry groceries or wash clothes. Yoghurt containers can be recycled as cups to pour water from. In South-East Asia I also dried the bucket out and filled it with a large bag of rice (cheaply bought!). I hid shells, coins and small toys inside, and Leo sat inside and sifted through the rice to find them. We’ve asked family and friends to send short videos to Leo, and one of his favourite things to do is watch them on the iPad. 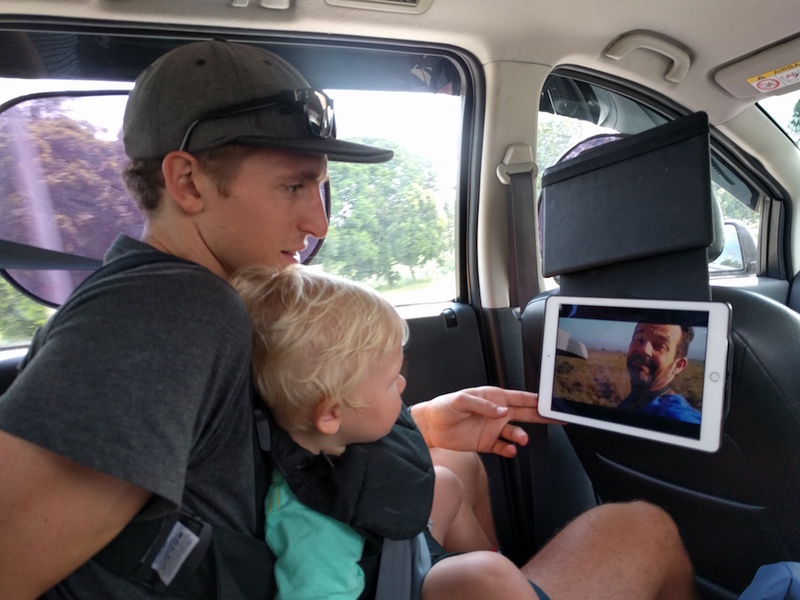 This is a great option for waiting in train stations, airports or as a quiet afternoon activity, and we can add as many videos as we like (or keep them on the cloud) so he can watch them again and again. It helps him stay connected with family and friends back home in a very special way. I mentioned we borrowed books in Bali and Malaysia. He grew very attached to one book in particular, so I filmed myself reading it so he could watch it even after we left. There are hundreds of children’s books read aloud on YouTube as well. I’ve learnt the hard way that some places in the world (Bali, many parts of Thailand, for example) don’t have free outdoor playgrounds for kids. Anywhere. Playgrounds are a toddler essential, so I now spend a lot of time researching locations and accommodation based on proximity to good parks. 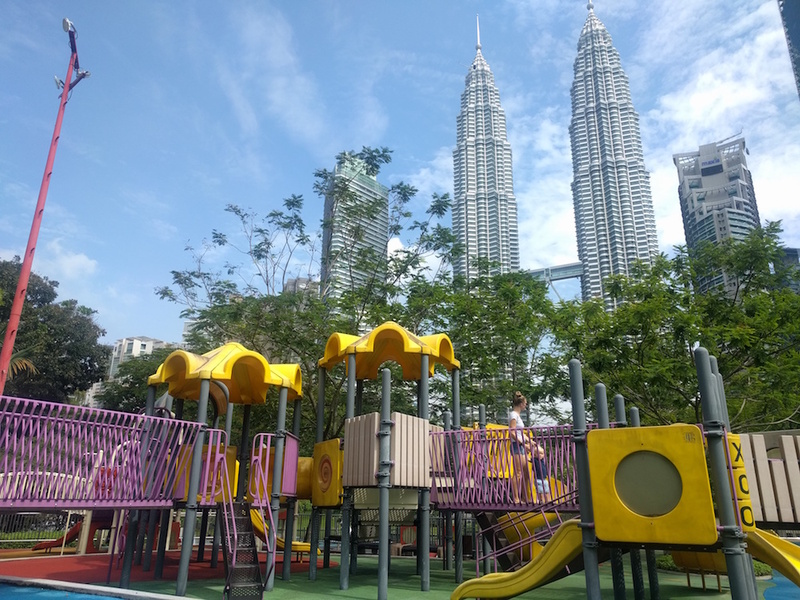 An amazing park overlooking the Twin Petronis towers in Kuala Lumpur. The relationship between a child and his or her favourite animal is a very special one. Animals seem to cast a spell over children of all ages, and stop even the most energetic of toddlers in their tracks. Finding and making friends with animals is a fun way for your child to learn the gentleness and quietness required to form bonds with animals. We named this horse Mr Tickles, and he became the go-to destination for our morning walks in France. 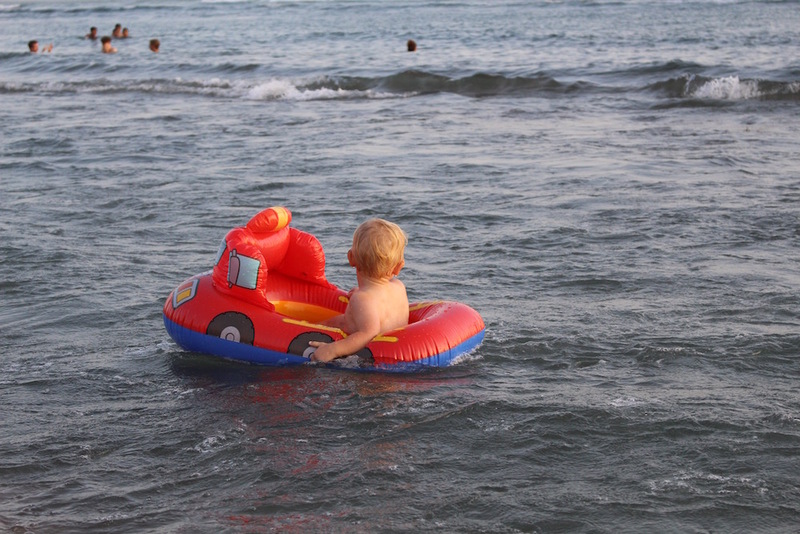 Have you travelled with minimal toys or tried culling your kid’s toys before? What other activities did they enjoy?